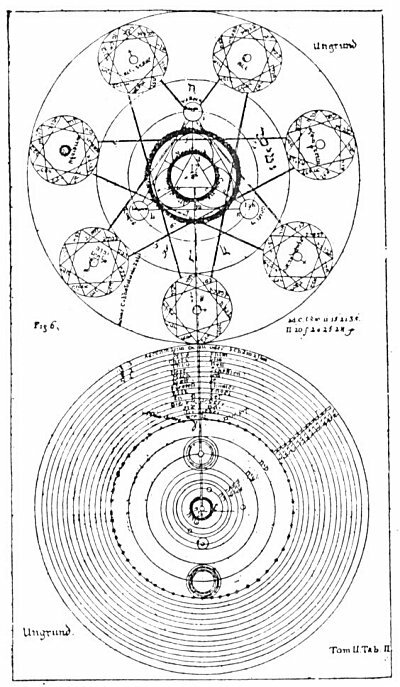 The five plates reproduced in Hargrave Jennings' book are part of a series of fifteen diagrams which appear in The Magical, Qabbalistical, and Theosophical Writings of Georgius von Welling, on the Subject of Salt, Sulphur, and Mercury. This extremely rare volume was published at Frankfort and Leipzig in 1735 and 1760. The numbers and figures on the charts refer to the chapters and sections of the Writings. 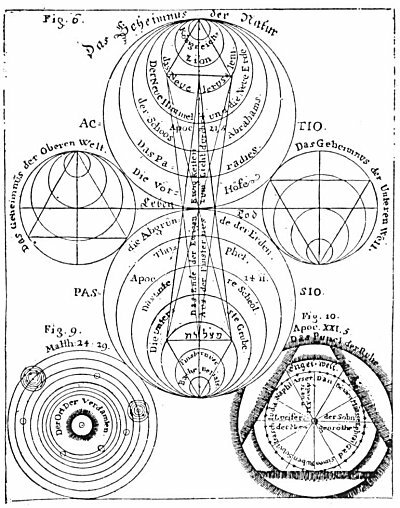 These fifteen charts constitute a remarkable and invaluable addition to the few other known admittedly authentic Qabbalistic and Rosicrucian diagrams. TABLE I, Figures 1-11. 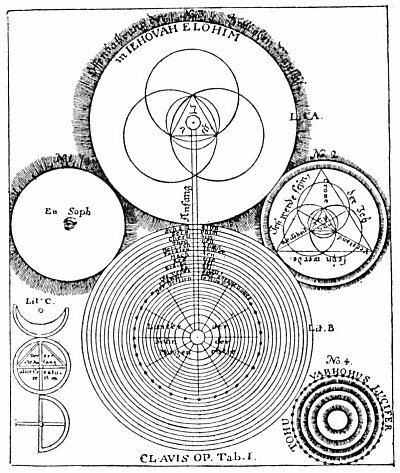 Figure 1 is a Ptolemaic chart showing the true relationship existing between the primordial elements. Its secret significance is as follows: The outer ring enclosed by the lines A and B is the region of Schamayim, a Qabbalistic name for the Supreme Deity, signifying the expanse of the heavens, or a spiritual fiery water. Schamayim is "The Ocean of Spirit, " within which all created and uncreated things exist and by the life of which they are animated. In the lower worlds Schamayim becomes the astral light. The space between B and C marks the orbits or planes of the seven Spiritual Intelligences called the Divine Planets (not the visible planets). According to the Mysteries, the souls of men enter the lower worlds through ring B, the fixed stars. All creation reflects the glory of Schamayim, the energy that filters into the spheres of the elements through the windows of the stars and planets. Between C and D lies the region of the subtle, spiritual air, a subdivision of ether. D to E marks the surface of the earth and sea, by which are also meant grades of ether. E to F marks the lower region, called "The Gathering of the Waters and the Production of the Virgin Earth, " or "Ares. " The alchemists called this "quicksand," the true mystic foundation of the solid earth. F to G marks the circle of the subterranean air, which is more dense and coarse than that in the outer space, C to D. In this denser atmosphere the stellar influences and celestial impulses are crystallized into corporeal spirits, thus forming the multitude of forms which exist without knowledge of their own fiery source. G is the region of the central fire of the element earth, a coarse fire in contradistinction to the divine fiery Schamayim. The sphere of the starry heavens likewise has its opposite in the sphere of the subterranean air; and the sphere of the upper air (or subtle vaporous water) has its opposite in the sphere E to F. The focal point, D to E, between the three higher and the three lower spheres, is called "The Reservoir." It receives impressions from both the superior and the inferior regions and is common to both. TABLE II, Figures 12-51. 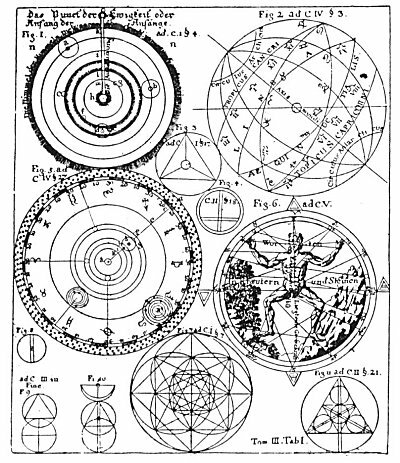 Figures 12, 13, 14 demonstrate the sphere as a symbol of motion to be emblematic of fire, water, and air; and the cube as a symbol of weight to be emblematic of earth. The sphere rests upon a point, the cube upon a surface; the sphere is therefore used to symbolize spirit, and the cube, matter. Figure 14 demonstrates that atmosphere rushing in behind a falling object increases its velocity and apparently adds to its weight. The essential nature of each element is occultly signified by the peculiar symbol and character assigned to it. imaginable. Figure 20 represents the outpouring of the upper and spiritual life into manifestation. Figure 21 represents darkness, for it is the loosening of the subterrene destructive principle. Figure 20 is also the symbol of day, and Figure 21 of night. Figure 22 is a symbol of water; Figure 23 is the complete universal character of light and darkness. The upright triangle represents Schamayim; the inverted triangle the dark earth which imprisons the infernal subterranean fire. It is "The First Day of Creation," or the time of the separation of Schamayim and Ares. 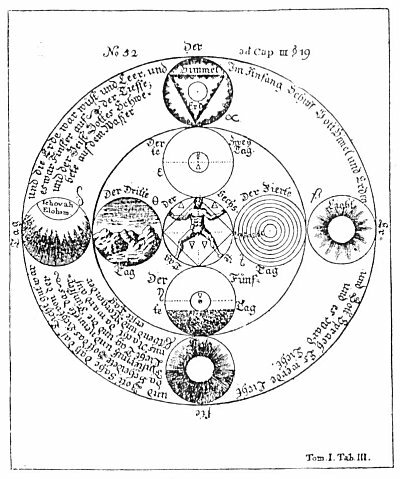 Figure 24 represents the six days of creation and proves that the elements are an outflow of the Divine Fire which, breaking up, becomes the substances of the tangible universe, as signified in Figure 25. TABLE Ill, Figure 52. The eight globes and the central square represent the seven days of creation. The three worlds wherein creation occurs are symbolized by three concentric rings. The German words in the outer ring are extracts from the first chapter of Genesis. The words around the outside of the outer ring are The First Day. The four small globes inside the outer ring deal with the abstract phases of creation. The upper globe containing the triangle encloses the words Heaven and Earth. The globe to the right contains the word Light, and the one to the left, Jehovah Elohim in the upper part and Darkness in the lower part. The globe at the bottom contains the word Day in the upper half and Night in the lower. TABLE IV, Figure. 53. Figure 53 has been designated the symbolic tomb of Christian Rosencreutz. The upper circle is the first world--the Divine Sphere of God. The triangle in the center is the throne of God. The small circles at the points of the star symbolize the seven great Spirits before the throne, mentioned in the Book of Revelation, in the midst of which walks the Alpha and Omega--the Son of God. The central triangle contains three flames--the Divine Trinity. From the lowest of these flames proceeds the first divine outflow, shown by two parallel lines descending through the throne of Saturn (the Spirit Orifelis, through whom God manifested Himself). Passing through the boundary of the celestial universe and the 22 spheres of the lower system, the lines end at point B, the throne of Lucifer, in whom the divine outpouring is concentrated and reflected. From him the divine light irradiates in succession to d (Capricorn), e (Gemini), f (Libra), g (Taurus), h (Pisces), i (Aquarius), k (Cancer), l (Virgo), m (Aries), n (Leo), o (Scorpio), p (Sagittarius), thence back to d. The zodiacal circles represent twelve orders of great and beneficent Spirits, and the smaller circles within the ring of fixed stars mark the orbits of the sacred planets. [paragraph continues] A represents the Father Principle, F the divine outflow, G the point of influx into the twelve orders of spirits (probably Sagittarius). The letters H, I, J, K, L, M, N, O, P, Q, S, and T denote the sequential points of irradiations to each other; W and X, the World of the Sons of God; and B, C, D, and E, the World of Lucifer. This plate shows the universe after the descent of Lucifer into matter. According to von Welling, when Lucifer wanted to control power, the influx of the divine light instantly ceased. Lucifer's world (which later became the solar system), with all its legions of spirits (who in their essence were Schamayim) reflecting his ideas and inverting the divine light, was turned into darkness. Lucifer's Schamayim thereupon became a contracted disc, a tangible substance; and Chaos came into existence. TABLE VI, Figures 55-59. 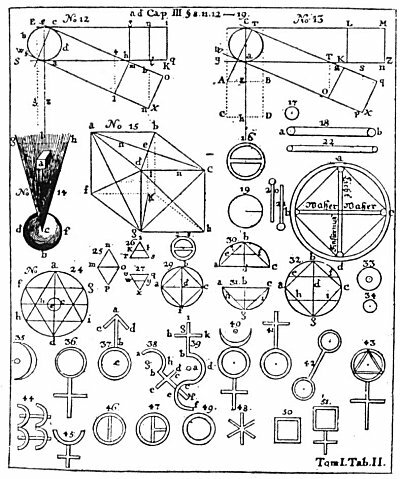 Figure 55 symbolizes the Chaos of Lucifer; Figure 56, the separation of light from darkness; Figure 57, the light in the midst of the darkness; and Figure 58, the regions of the elements and their inhabitants. The four A's signify the Abyss surrounding all things. The A B is the fiery throne of Lucifer. The plane of g is the subterranean air; f, the subterranean water; c, the earth region; d, the outer water; e, the outer air, W and X the region of Schamayim. The elemental inhabitants of the planes differ in goodness according to their proximity to the center of wickedness (A B). The earth's surface (c) divides the subterranean elementals from those of the outer water, air, and fire (d, c, and X). The elementals of the upper strata (the upper half of c, and all of d, e, and X) represent an ascending scale of virtue, while those of the lower strata (the lower half of c, and all of f, g, and A B) represent a descending scale of depravity. TABLE VII, Figures 1-5, 7, 8. (Table VIII has Figure 6.) Figure 1 is the triune divine sulphur, the All-Perfect out of the All-Perfect, the Soul of creatures. The threefold Divine One is symbolized by three interlaced circles designated alchemically salt, sulphur, and mercury. In the central triangle is the divine name Ehieh. Geist means spirit. The other words require no translation. Figure 2 is common destructive sulphur. A bar placed in the triangle makes it the character of earth. Figure 3 is true oil of vitriol, composed of a circle with two diameters and two reversed half-circles hanging below. In this are hidden the characters of all metals. Tin is symbolized by Figure 4 and iron by Figure 5. 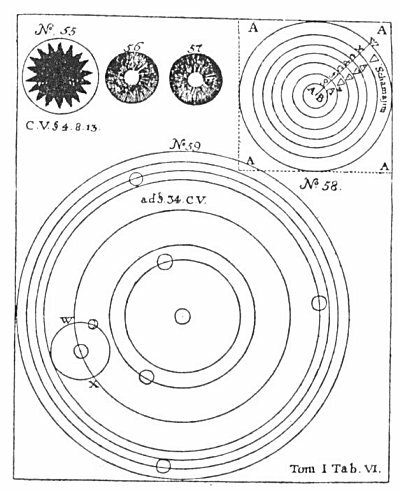 Figure 7 is the solar system according to Copernicus. Figure 8 is the last judgment. The sun is removed from the center of the solar system and replaced by the earth. This changes the respective positions of all the other planets except Mars, Jupiter, and Saturn, which retain their respective circles. The letter a signifies the circle of the sun; b, that of Mercury; c, that of Venus; d, (sic) that of the moon; and E, that of the earth. Inward from the sphere h are the great circles of damnation. TABLE VII., Figure 6. In Figure 6 the letter a marks the center of eternity. The motion of the rays toward b, d, and c was the first divine manifestation and is symbolized by the equilateral triangle, b, d, c. The eternal world within the inner circle became manifest in the water (salt), the light (mercury), and the fire (sulphur) of the archetypal world, represented by the three circles (f, e, g) within the triangle of complete equality (h, i, k), which is in turn surrounded by the circle of the high throne. The circle f is named understanding; e, wisdom; g, reason. In circle i is the word Father; in circle h, Son; in circle k, Spirit. The seven outer circles are the seven spirits before the throne. The lower part of the figure is similar to Figures 53 and 54. The outer circles are the angelic world ending in the cognizable world of the Sons of God. Then comes the circle of the visible constellations and fixed stars; within this is the solar system with the sun as the center (l). Ungrund means the Abyss. TABLE IX, Figure 9. Figure 9 is a synthesis of the Old and New Testaments and represents the interblending planes of being. 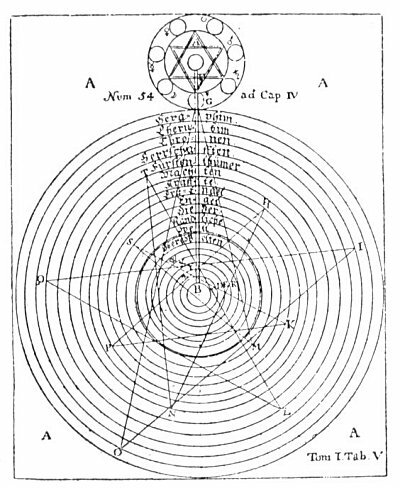 In the right margin the seven outer circles contain the names of the planetary angels. The words in the graduated circles from the top triangle downward read: (1) Abyss of Compassion; (2) Zion; (3) The New Heaven and the New Earth; (4) The New Jerusalem; (5) Paradise; (6) The Bosom of Abraham; (7) The Outer Courts of the Lord. From below the circles of darkness reach upward, each divine principle being opposed by an infernal opposite. The small circle on the left containing a triangle and cross is named The Tree of Life, and that on the right The Tree of the Knowledge of Good and Evil. 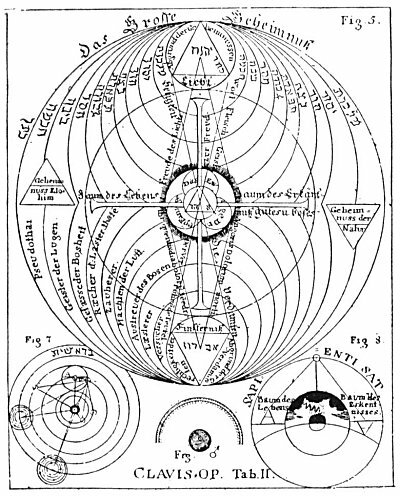 In the center of the diagram is the Trinity, joined with the superior and inferior planes by lines of activity. TABLE X, Figures 10-15. 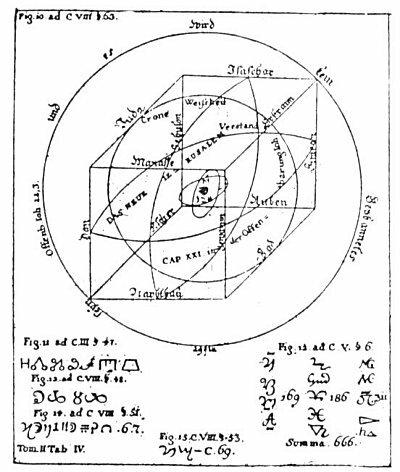 Figure 10 shows the New Jerusalem in form of a cube, with the names of the twelve tribes of Israel written on the twelve lines of the cube. In the center is the eye of God. The words round the outer circle are from the Book of Revelation. Figures 11, 12, 13, 14, and 15 possibly are cipher symbols of the angels of the plagues, the name of the Antichrist, the signature of the beast of Babylon, and the name of the woman riding on the beast of blasphemy. TABLE XI, Figures 1.-11. Figure 1 is the solar system according to Genesis. The o on top of the radius of the circle is the dot of Eternity--the Beginning of Beginnings. The whole diameter is the outflow of God, manifesting first in the heaven of heavens--the Schamayim, in which region human understanding cannot function. The space from k to i contains the heavens of Saturn, Jupiter, and Mars; l to m, the heavens of Venus and Mercury; m to h, the heavens of the sun. The letter e is the moon, the circle of the earth. Figure 2 is the globe of the earth, showing the houses and signs of the zodiac. Figure 3 is the character of the Universal Mercury (Divine Life) in its triune aspect of mercury, sulphur, and salt. Figure 4 is true saltpetre purified with quicklime and alkali. Figure 5 shows the exact degree or angle of the planets' places as well as the individual fixed stars in the zodiac. The letter a is the sun and b is the earth. From k to i are the circles of Mercury and Venus; g to h, the circles of earth and moon; f to e and e to c, of Jupiter and Saturn; c to d, the starry belt or zodiac. Figure 6 is the Microcosm, with the planets and signs of the zodiac corresponding to the different parts of its form. The words upon the figure read: Know thyself. In words, herbs, and stones lies a great power. Figure 7 is the universal character from which all characters have been taken. Figures 8, 9, and 10 are left to the solution of the reader. Figure 11 is the radiating Universal Mercury. TABLE XII, Figures 12-19. 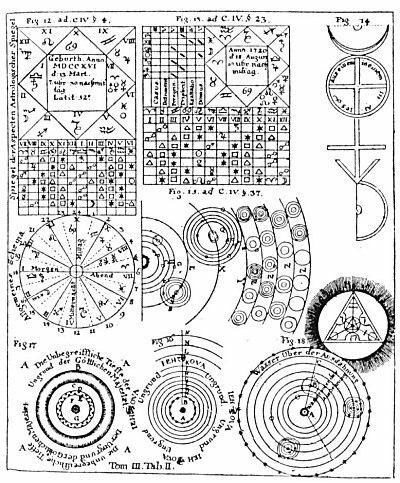 Figure 12 is called A Mirror of Astrological Aspects. Below it is an astrologer's wheel. Figure 13 is similar to Figure 12. Figure 14 is a secret alchemical formula. The words around the circle read: Out of one in all is all. Figure 15 is an unsatisfactory attempt to show the comparative sizes of the suns and planets and their distances from each other. 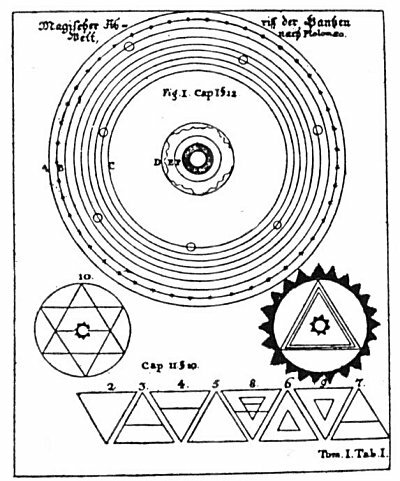 Figure 16 is the solar system with its internal and spiritual heavens. A B is the solar system; C is the sphere of fixed stars; D, E, F, G are the systems of the spiritual worlds; H is the throne of the living God; J, K, L, M, and N are the Great Beyond, unmeasurable. 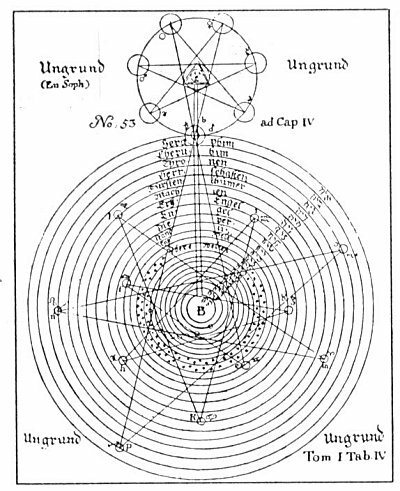 Figure 17 shows the creation of the solar system out of the ring of the Divine Eternity. The four A's are the Abyss, B is the first revelation of God out of the Abyss, and from this revelation C, D, E, F, and G were created. C and D represent the spiritual hierarchies; D and E, the upper worlds, or constellations; E and F, the distance from Jupiter to the upper worlds; F and G, the solar system with its planets and their heavens; B and C the throne of Christ. TABLE XIII, Figures 1-4. Figure 1 is Ain Soph, the Incomprehensible Abyss of Divine Majesty, an endless welling up, limitless in time and space. Figure 2 symbolizes the three Divine Principles--Father, Son, and Holy Ghost. Around the triangle is written: I Shall Be That I Shall Be. At the apex of the triangle is the word Crown; in the left point, Wisdom; in the right point, Understanding. Figure 3 represents the Trinity with its outflow. The words above the upper sphere are Revelation of the Divine Majesty in Jehovah Elohim. The lower circles contain the names of the Hierarchies controlling the lower worlds. The words within the circle of stars read: Lucifer the Son of the Aurora of the morning. The letter C represents the Universal Mercury. The words within the circle read: The first beginning of all creatures. Figure 4 represents the abode of Lucifer and his angels, the Chaos spoken of in Genesis. TABLE XIV, Figures 5, 7, 8. Figure 5 shows the triangle of triune Divinity in the midst of a cross. At the left is a small triangle containing the words The Secrets of Elohim, and at the right is another inscribed The Secrets of Nature. On the horizontal arms of the cross are the words The Tree of Life and The Tree of the Knowledge of Good and Evil. The plate explains the interblending of the spiritual and infernal powers in the creation of the universe. Figure 7 is called The Road to Paradise. It probably indicates the positions of the sun, moon, and planets at the moment of their genesis. 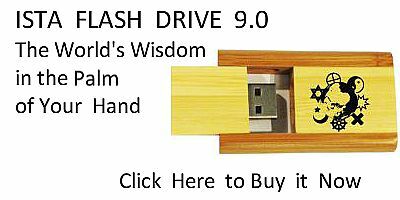 Figure 8 is the earth before the flood, when it was watered by a mist or vapor. The words at the left are The Tree of Life; those at the right, The Tree of the Knowledge of good and Evil. 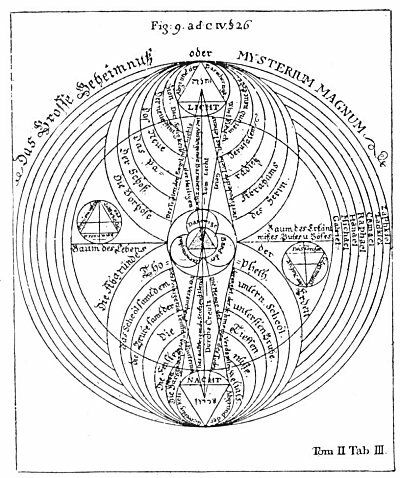 The diagram with the symbol of Mars is devoted to a consideration of the rainbow. TABLE XV, Figures 6, 9, 10. Figure 6 is similar to Figure 5 and is called The Secret of Nature. An interesting diagram is shown on either side of the central figure, each consisting of a triangle with circles radiating from its points. The diagram on the left is called The Secrets of the Upper World, and the one on right The Secrets of the Underworld.